Dashlane Review 2019: Is Dashlane Safe & Secure to Use? Given the current situation where security breach in internet-world is so common and frequent, your passwords hold an important role from preventing you and being prone to those breaches. However, using unique and strong passwords for each of website you log into and remembering all of those can be almost near to impossible, without a password manager! So, Dashlane is one of the best options out there for a password manager, doing all the hassles for you at a single click. In this Dashlane review, we will discuss and review all the aspects of Dashlane’s latest iteration, Dashlane 6. Dashlane Review 2019: What is Dashlane? How much does Dashlane Premium Cost? 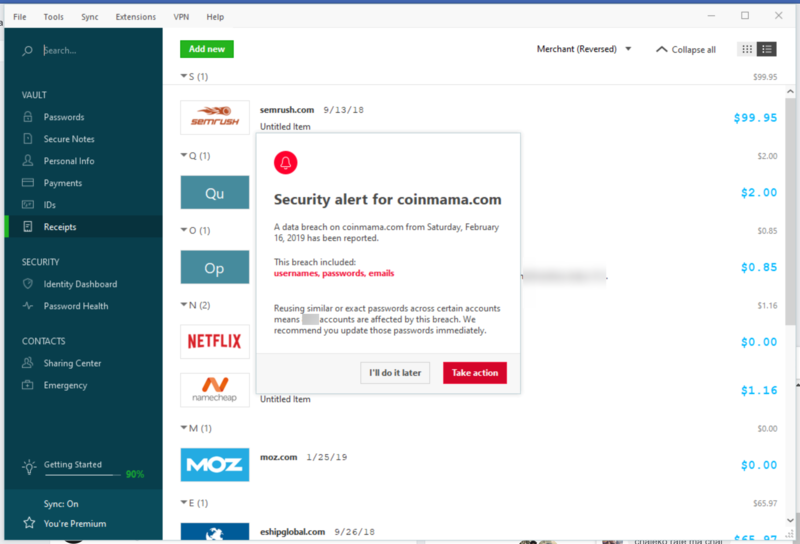 Dashlane Review 2019: Features & What’s new in Dashlane 6? What Platforms does Dashlane support? Dashlane Security Review 2019: Is Dashlane Safe and Secure to use? Is Dashlane Free? If Yes, How do I get Dashlane Premium for free? Wrapping Up: Is Dashlane Premium worth paying? With the older version, versions older than Dashlane 6, Dashlane used to be a simple password manager tool. 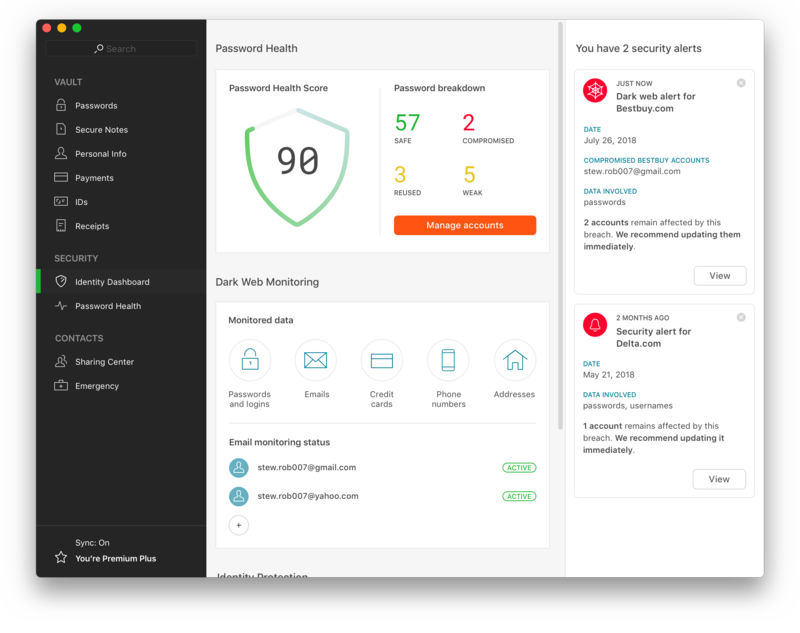 However, with the newest incarnation, Dashlane 6, Dashlane is more than a password manager, Dashlane is all-in-one security manager for you. In addition to the existing password storage, autofill, generator, and changer features, Dashlane 6 brings all the best features like in-built Premium VPN, digital wallet and security alerts. Dashlane covers both grounds, and comes with two options; Free and Paid versions. Previously offering unlimited password storage, with the Dashlane 6, now the free version can store up to only 50 passwords and can be synced to only one device. However, the features like form and payment autofill, security alerts, password generator, password changer, emergency contact access, secure notes, standard 2FA, and password sharing up to 5 accounts are available for the Dashlane free version. Compared to the top competitor, LastPass has no limitations on how many passwords you can store or syncs across multiple devices. The main drawback to this free version is the Dashlane doesn’t offer cloud backup for the saved passwords, which means the users have to perform a manual backup to be safe from losing the passwords. 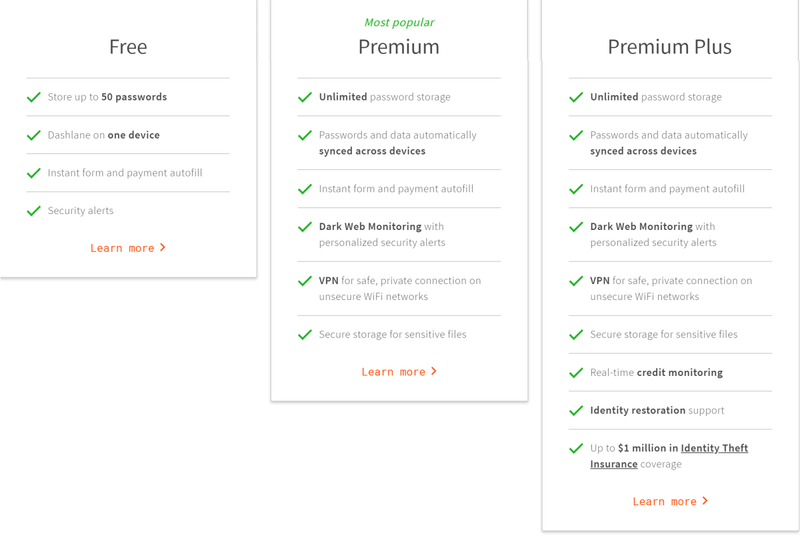 Dashlane offers three different options for the paid versions; Dashlane Premium, Dashlane Premium Plus, and Dashlane Business. The premium plans cost as high as $4.99/month, billed $60 annually for Dashlane Premium, $9.99/month, billed $120 annually for Dashlane Premium Plus, and Dashlane Business costs 4$ per user/month, billed annually. However, Dashlane has different price plans according to geo-location, the lowest we’ve discovered is $3.33/month, billed $39.96 annually for Dashlane Premium. The premium plan has its own perks of unlimited password sharing to dark web monitoring, VPN protection and much more. And similarly, with all the benefits from the premium plan (minus the VPN), Dashlane Business has secure password sharing for a group of 50+ users. However, should the service not work for you, you can always claim the refund as your buy is protected by Dashlane’s “30-Day Money-Back Guarantee”. Setting up a reputed program like Dashlane is easy as it should be. The first way to get started is to download the Dashlane Desktop application. After you download, Dashlane will ask you to either login or create an account. While creating an account, you will be asked to enter your email address and master password. The master password has to be at least eight characters, one uppercase, one lowercase, and one number! Because of the zero-knowledge architecture that Dashlane strictly follows, Dashlane doesn’t store or provide any method to recover your master password. Should you forget your master password, the only viable option would be wiping your account and begin again. From there, the welcome screen guides you the features offered, and ask you to review passwords, where the Dashlane will offer you an option to pull the passwords from the browsers installed on your PC. The next screen will guide you through installing the Dashlane browser extension in your default browser and prompt you to enter the details like full name, date of birth and phone number for auto-fill form. However, all these steps can be skipped and performed later at ease. Coming to Dashlane 6, Dashlane has carried out a huge overhaul from the previous versions. With the introduction of the newest features in their store, Dashlane 6 proved itself a worthy all-in-one security app for protection of consumers’ digital life. So, what’s really in this Dashlane 6 newest version? 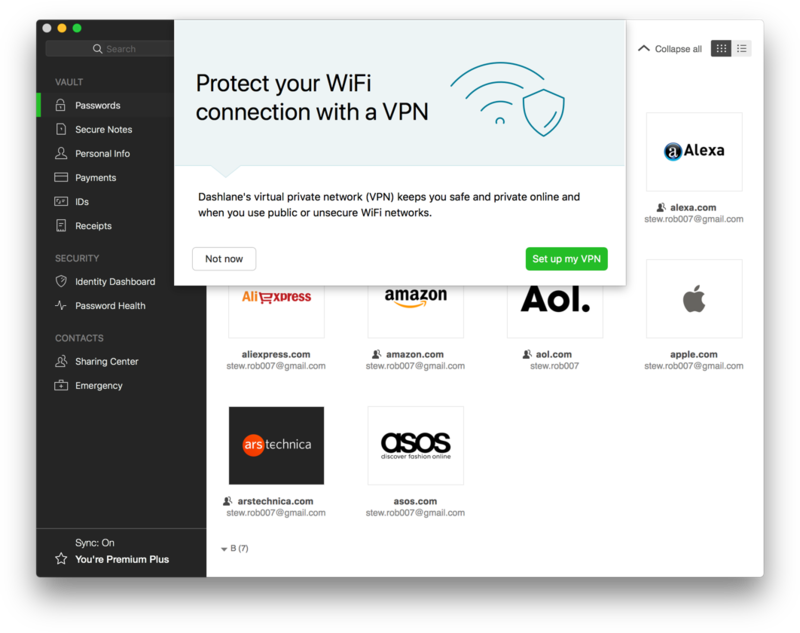 Dashlane 6 introduced a new feature, VPN, in their store. If you are not familiar with “what VPN is”, for starters, VPN is just a mask, creating an encrypted tunnel between you and the internet. And, VPN is something you really need to stay safe and secured while using public networks. Though the Dashlane 6 has this VPN feature enabled for the Premium only, not even for the Premium subscription acquired from referrals and free trial, has no country connection or server to choose from. Meaning, you get to use only what Dashlane has to offer. Nonetheless, for the price of the Dashlane 6 Premium, VPN feature is just an extra topping on your pizza. Lately, if you have been updated with the latest security news, security breaches are no new thing. Big, giant companies where users’ data is protected in the fortress of security, and yet they suffer from the biggest threat of security breaches. Recent Jan 2019, Facebook security breach compromised usernames and passwords of millions of users, and similarly Quora’s Nov 2018 breach leaked encrypted data of 100 million users. These breached data/credentials are sold and exchanged on the dark web. And in this new iteration, Dashlane 6 employs Spy Cloud’s licensed Dark Web Data and crosschecks your data associated with your email addresses. However, this “Dark Web Monitoring” feature isn’t enabled by default. To activate it, you need to open “Identity Dashboard” under “Security” section, and add email addresses you want to scan! After you add the email address, Dashlane sends a verification email to confirm your ownership of those email address, and once confirmed, Dashlane scans the data. If the breach found, you will be notified as security alerts. You better act fast and change the passwords of the compromised emails for the breached websites. If you have been an earlier user of Dashlane, you would probably know, Secure Notes is not a new feature of Dashlane 6. In fact, what new is, it’s “Secure File Storage” bundled with the existing secure notes. Secure Notes allows adding and storing up to 1GB of files in an encrypted format, be it any classified documents, synced across the devices. Dashlane 6 Premium Plus has an extra feature to monitor and secure the users’ credit score. To get started with “Credit Monitoring”, you need to go to Identity Dashboard and signup on the TransUnion website. When enabled, the users are notified for every important change made to your credit report. Also, should an identity theft occurs, provided by TransUnion, this service will help you in identity recovery. In addition, if claimed, you can be entitled to $1 million as identity insurance. To note, Credit Monitoring can only setup via desktop and mobile applications, not supported on the Dashlane web app. Note: Dashlane Premium Plan Plus is exclusively available for the US only. Dashlane has this feature to list a contact to give access to view all [or selected items] data and passwords in your Dashlane account when requested within the set waiting period. The waiting period can be set to none or up to 60 days, allowing to decline request within that waiting period. Under the Contacts, there’s another great feature; Sharing Center. With the “Sharing Center”, the users can share the passwords and the notes in an encrypted format. The recipients can be granted either limited rights to only view and use the shared data, or full rights to view, use, re-share and even revoke your access to the data. Dashlane is not just a password manager, but a 360 digital security manager. So, besides saving and securing your passwords, Dashlane has a feature to save your all payments details such as Credit/Debit Card, PayPal account and bank account. Furthermore, Dashlane also saves your IDs such as National ID card, Passport, Social Security Card, Driver’s License, and Tax Numbers. These data are auto-filled detecting on web-forms. Other than that, Dashlane offers an extra feature to capture and store all your online shopping receipts whenever you shop. The receipts can be sorted by Merchant name, Category, Price, and Date of Shopping. Dashlane supports a wide range of platforms and browsers. Dashlane has a standalone app for Windows, Mac, Linux, Android, and iOS. And similarly, Dashlane has browser extension for Firefox, Chrome, Safari, Microsoft Edge, and Internet Explorer. Being on the internet, it’s quite clear, nothing is 100% fool-proof or hack-proof. Whether it’s the security manager software and services themselves. Well, Dashlane has implemented all the security walls and precautions to prevent or outdo any security breach scenarios. Dashlane employs a standard form of AES-256 encryption and stores the data securely with the AWS. Given this security measure, your single password is scrambled into 1.1 x 1077 possible combinations. And if in any case, Dashlane is hacked, it would hackers 3.31 x 1056 years to crack your password or data stored on Dashlane. Pretty safe! Since Dashlane follows the zero-knowledge system, Dashlane doesn’t share the user data with any server, organization or person. In addition, the master password you create to secure all the data on the Dashlane is never saved on Dashlane cloud, server or anywhere. Meaning, the master password is only and only known to you, and no one else has access to it. Moreover, Dashlane asks for 2FA code before allowing new devices to complete data access. It has built-in 2FA, also supports mobile authenticator apps like Google Authenticator, and authenticator devices such as U2F YubiKeys for wider options. Dashlane embraces the latest biometric logins on mobile devices and PCs. On Windows, Dashlane desktop app can be logged in with the Windows Hello. On Apple devices, with Face ID and on Android, only fingerprint logins are accepted. Dashlane regularly employs paid white-hat hackers and professionals to pen test to discover any weak points, improve the defenses and avert security breach from happening. As we have already mentioned Dashlane has both free and paid plans. So, given the fact, yes, Dashlane is free. However, Dashlane Premium can also be used for free but requires a little extra effort. Dashlane free version should be enough and do the job unless you’ve tons of passwords to manage and store. And in that case, Dashlane Premium plans step in. However, as the premium plans cost as much as $40 per year, you can actually opt-in to save that forty bucks and enjoy premium membership. Yeah, totally possible. Most of the reputed software products offer referral bonus and trials, and Dashlane is no exception. In fact, Dashlane is more generous than any other. Dashlane gives away 1 month of Dashlane Premium trial for signing up and 6 months for per friends referred. And there’s no limitation on how many friends you can refer. Register on Dashlane.com, set up the app. And you are good to go with 1-month free Dashlane Premium trial. No extra activation. No credit card entry. Inviting your friend to use Dashlane will give you both $20 worth in Dashlane Premium, which is 6-months of Dashlane Premium equivalent. For Dashlane web-app, click on gear icon “My Account”. For the Dashlane desktop app, click on “Help” from the top menu bar. A next tab opens automatically, and you copy and share the referral URL with your friends directly via email, Facebook or Twitter. As soon as your friend registers and downloads browser extension or desktop app or mobile app using your referral URL, you both will be rewarded with 6-months of Dashlane Premium for free. However, for Dashlane mobile app users, you can share your referral URL directly by clicking on “Inviting a Friend”. Likewise, this method also does not require to enter any payment information. Dashlane has been our first choice for the password manager software. Besides, we can’t deny the fact that competitors like LastPass and 1Password give Dashlane strong competition. Nonetheless, weighing all the pros and the cons, a decision, on whether Dashlane is worth paying or not, shouldn’t be a hard one to make. However, at the end of the day, it’s all about the users’ choice. So, even if you are not sure on spending the money without giving a try, well, there’s a 1-month Dashlane Premium free trial, plus, 30-day money back guarantee. If you have any queries regarding Dashlane or any opinions on this Dashlane review, please do let us know in the comments down below. Blinkist Review 2019 & How to Get Blinkist Premium for free?